People talk about how important it is to get out of one’s comfort zone to improve our knowledge and test ourselves. For me, as for many freelance translators who spend most of their time in their ‘home caves’, networking can be considered a light version of leaving my comfort zone. I live in London, where there’s no shortage of events related to translation and many other interesting topics, many of which I attend happily. However, going to a three-day conference is another kettle of fish, or the same kettle but much bigger, really. 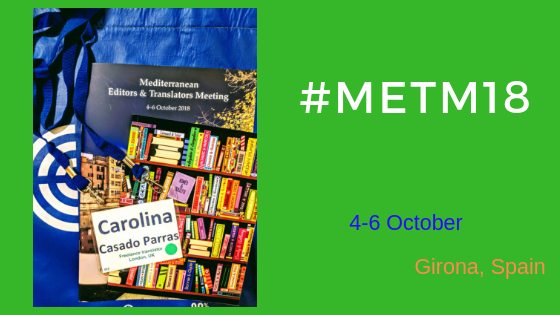 A few days ago I attended METM 2018 – the Mediterranean Editors and Translators’ annual meeting. Why did I choose that one as my first? The truth is that the programme didn’t seem to be right up my street – many sessions sounded more appropriate for those working in(to) English and/or in the academic world – but the turnout seemed relatively small (175 attendees this year), the fee was more than fair (just above £200), and I had heard it’s a friendly, close-knit community. 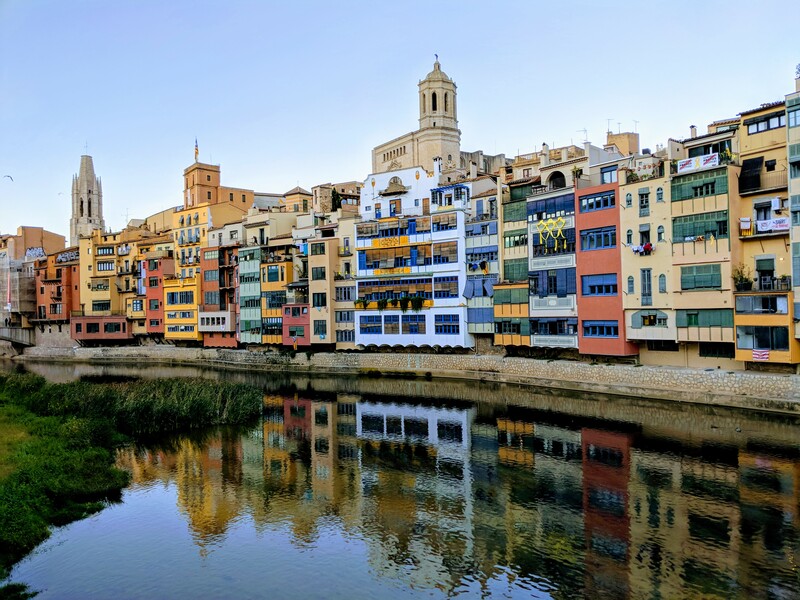 And yet another reason: it was held in Girona, Spain this year! A great opportunity to visit unexplored territory in my home country. One of the things I loved most were the off-MET activities: from organised meals to guided visits of the city, group bike rides, and a translation slam. Apart from going on the city tour and attending my first slam (which I loved!) I went to a foodie translators dinner and a book-lovers lunch, both of which were a fantastic opportunity to meet colleagues with similar interests, as well as getting tips for better cookie baking and tons of new ideas for books. The pre-conference workshops were the first chance to get my hands dirty with work. I attended Translating for the Art World, where I got some good tips and ideas. The hands-on part of it, though, would have been more useful if I had been able to translate into Spanish. Working in groups where English is the shared language makes for unrealistic practice for people with other target languages. On Friday afternoon the real work started in the charming Centre Cultural La Mercè: sessions on three tracks, except for the two keynotes. Some talks were useful to confirm I am actually doing things ‘right’, others were too focused on specific research studies and the practical tips section in my notebook ended up dry, and others were a good call to action so I look into things I have played with but haven’t explored further, for example corpora. The keynote by Daniel Hahn welled over with humour and some good points to reflect on concerning editors being translators’ best friends and not their enemies. Here are my tips for first-time conference attendees; feel free to share yours in the comments section. Look at the programme beforehand and draft a schedule. Needless to say you can change your mind and go to a different talk once you’re there, but this will avoid rushed decisions. Take part in as many fringe activities as you can. There’s no better way to meet colleagues in a relaxed atmosphere. You can share your passions over food and drink if it’s a meal, learn about the history of a new place, and so on. Resist the temptation to skip sessions. True, there are talks that may be totally pointless to you, but more often than not you can still learn something new. Make an effort to approach new people to expand your network. It’s very comforting to see colleagues you already know, but try not to spend all your time with them. Having said that, I wouldn’t recommend going on a frenzied race to shake hands with everyone. Fewer contacts with whom you can actually talk for a while are probably better than small talk with a ton of people. Keep the conference booklet or guide close. Not only does it contain the programme and practical info about the city and venue, but most importantly, it has a list of attendees. Mark those you’ve talked to and add a note about how/when you’ve met them (eg during the city tour or at a dinner), otherwise you may forget who they are after a few days seeing so many different people. This will make it easier to connect with them on LinkedIn, Twitter or via email after the conference. Arrive a day early or stay a day longer if your personal life and/or work situation allows it. You’ve already made it to a new place, so you might as well take advantage and explore beyond the conference venue. If this is held in a country where any of your working languages is spoken, more of a reason to extend your stay. Anything to squeeze in some informal CPD, right? 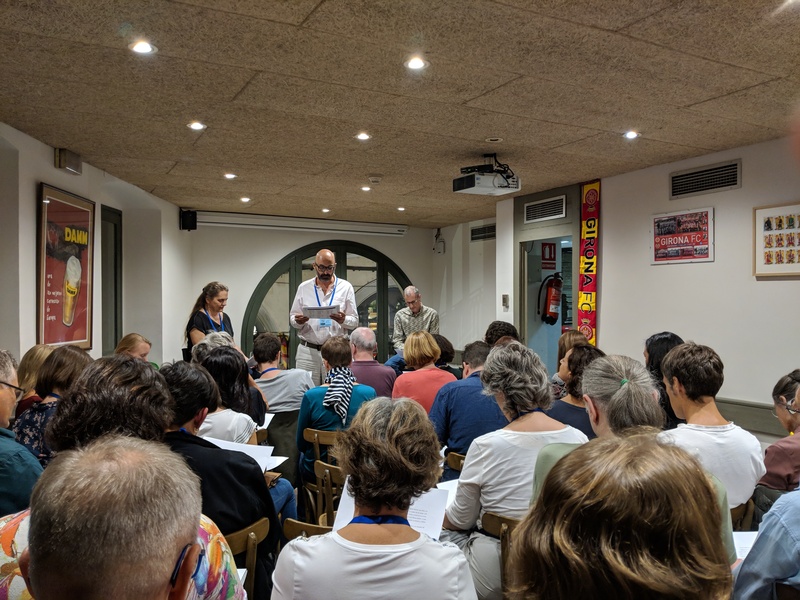 All in all, METM18 was a good first translation conference. I have decided to explore different ones until I find the best match for me, but one thing is for sure: every time I leave my comfort zone I land on the winning end of things. Sometimes it’s knowledge, other times it’s new contacts, but what I gain every time is the certainty that I have it in me to tear down whatever barriers I imagine might be outside the comfort of my computer screen. Do you remember the first conference you attended? Did you make the best of the experience? Maybe you’re planning to go to one for the first time? Share away! Thank you for this interesting and balanced review. I’ve wondered about joining at MET for a while. I think that attending the conference would be too tricky for the next few years (small toddler), which seems like the highlight of membership, do maybe in a few years time. 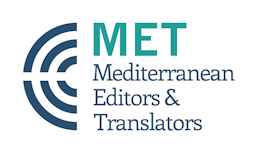 I did read once that it’s specifically recommended for translators living in the Mediterranean region, so do you still find it helpful being a member even though you live in the UK? No, living in the UK isn’t a problem. I think the ‘Mediterranean’ is more related to your working languages than to where you’re based. That being said, there were a few colleagues whose language combinations were English + other Central European language and still found it useful. The practical parts are definitely orientated towards English as a target language, but other topics apply to all.